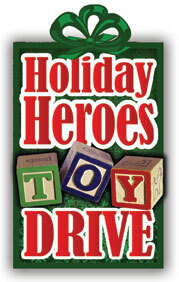 Orange County, FL – Orange County Mayor Teresa Jacobs has launched her 2013 Holiday Heroes Toy Drive. This is the third year Mayor Jacobs and her team has facilitated the toy drive. The toy drive, which serves children from infants to 18-years-old, encourages the community to bring new, unwrapped toys to participating drop-off centers. Last year, Orange County collected more than 2,600 toys for area children. Donated toys will be delivered to children through the Marine Toys for Tots Foundation in Orlando, Wraparound Orange, the Orange County Neighborhood Centers for Families, and the Community Food and Outreach Center. Mayor Jacobs will also “flip the switch” to illuminate Heritage Square Park at the Orange County Regional History Center’s annual Holiday at Heritage Square event. This free event, featuring Santa, activities and crafts for the entire family, kicks off at 6 p.m. on Tuesday, December 3, 2013 outside the History Center, 65 East Central Boulevard. For more information and gift ideas, visit www.ocfl.net/holidayheroes.